Each of the seven major religions teaches one segment of the body of knowledge necessary to understand to create the life each of us wants, and students of the Faith of the Pure Ray are using that fact to start on their journey to create their life, but our focus now is on the power games the religions play that seem to stop our progress. Each religion has a favorite power game. Christians wage war, and as the power games devolve, one game leads to another, starting with wars. Power games are oppressive to the people. 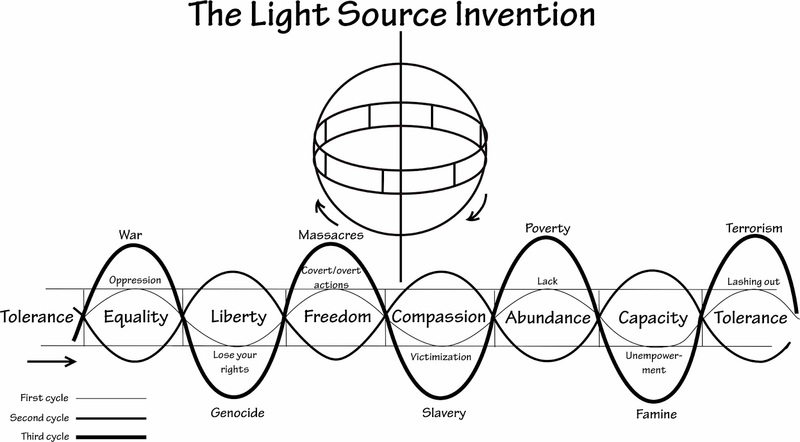 The Light Source Invention demonstrates how the power games devolve from intolerance, and that is what leads to a sense of oppression. People who are dragged into wars lack equality, so your plan to create your life must treat all people fairly and equally for it to be successful. When you come up with a plan, even one that benefits all people and stands on all seven principles, there will be people who believe they have the right to put you down, and this is based on intolerance. No one has the right to put you down, and what they are doing is going against Universal Law, but it takes time for the backlashes to occur, so their next step is to deny you your rights, and this also goes against Universal Law. We have the demonstrations of Jesus of Nazareth based on his crucifixion and overcoming death, and of Moses on freeing the Hebrews from slavery by the Egyptians. Leaping forward to the future, the resistance ends when your adversaries are able to create a financial foundation based on your plan--but it cannot be because their are stealing your plan. The idea is to keep walking forward around the planning circle to create your life, and as you to, your adversaries will follow until they see how they will benefit from your plan. The color of Judaism is orange, and that is also the color of productivity and technology--the application of the idea of the plan. It involves starting around the planning process and bringing in partners to help you create your plan. The power game of choice for Jews is genocide, which comes from a sense of judgment. People who believe they have been victimized oftentimes start genocides. The plan for the international government has met this same resistance from those who are grabbing for power and who rely on the existing structure for their financial support. it won't be until they are able to create a financial foundation based on the new structure that they will see the benefits of the plan. So, imagine if we put these two steps together, who do they trust to be their business partner or partners? If the most powerful oligarchs from every nation rise to become political leaders, and all 200 come together to create an international government, this is their grand opportunity to get their life, but it is based on the power games that seem to allow them to climb over the backs of others. Their plans do not treat all people fairly and equally, and they go against Universal Law. Their next step is to deny their inalienable rights to the people. Moses was in this situation. The Egyptians were very powerful economically, and the pharaohs ruled by force, but oftentimes outside of their capacity. The plan for the global renaissance requires every person on the planet to function for his or her own capacity, and the Faith of the Pure Ray helps to start the process.